Inception: Whose Mind Is It, Anyway? 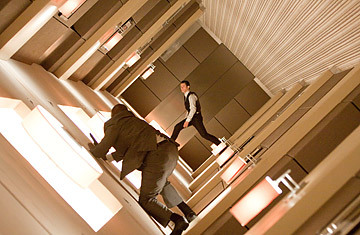 Joseph Gordon-Levitt as Arthur in the Chistopher Nolan film Inception, a Warner Bros. Pictures release. "Wait a minute," says Ariadne (Ellen Page), the newcomer in this daredevil dive into someone else's dreamscape. "Whose subconscious are we going into, exactly?" The line gets a sympathetic laugh from preview audiences watching Inception; they may share Ariadne's bafflement, along with the rush she feels in plunging into the glorious, perilous unknown. Inception is writer-director Christopher Nolan's first movie since The Dark Knight, the second in his Batman series, a film that earned $533 million in North American theaters, $1 billion worldwide and carloads more on DVD. Perhaps as a reward, Warner Bros. did exactly what a studio should do: let a proven hitmaker spend $160 million on a project that's hard to cozy up to or even explain, a story about dreams  our most intimate intellectual property  and about how they may not be safe from theft. The film proposes that while you sleep, a team of Mission: Impossible types (led by Leonardo DiCaprio's Dom Cobb) can invade your mind and extract  or insert  information, then sell it to your worst enemy. See TIME's photoessay "Leonardo DiCaprio Plays for Hollywood's Biggest Directors." But how to sell Inception to the mass audiences it will need to attract to make a profit? With a stealthy marketing campaign, including mystifying trailers and a giant trompe l'oeil mural in midtown Manhattan in which a building's top left corner seemingly peels off to reveal the offices inside. The campaign mimicked Inception's plot: it planted a vague but attractive idea in the minds of moviegoers, leading many to say about the film, "I don't know what it is, but I have to see it." But seeing Inception  or seeing it twice, which we suggest  does not answer all the riddles. This is a film more to admire than to cherish, one that aims to fascinate rather than to satisfy familiar impulses. It's a beautiful object, like a perpetually spinning top, not a living organism. Though the plot is really one giant hallucination, it's an experience that doesn't blow your mind so much as challenge it. Viewers will have to work to keep up with all the shifting perspectives and layers of deceit. Inception is like the coolest, toughest final exam  or like the dream of one, in which you're suddenly in class and you realize you didn't prepare for the big test. This is a movie that you'll wish you had crammed for. Or call Inception an elaborate video game, except that you don't play it; it plays you. The turning of those particular tables is Nolan's gift. In Memento he built a narrative machine that ran backward to the scene of a crime. The Prestige was about two master magicians trying to fool each other, with their lives on the line  as their master, Nolan, stood behind the camera fooling the audience. He's a bit like the Joker in The Dark Knight, devising silly or malevolent but always intricate schemes to outfox his audience. Inception is another confounding Chinese puzzle. The film has such a complicated premise that it needs to keep explaining the rules of its game. For this fantasy world has three levels of increasing power and danger: the dream, the dream-within-a-dream and the dream-within-a-dream-within-a-dream. (The DVD version could benefit from an onscreen number identifying each level.) There's also actual, waking reality, in which Cobb can be assaulted by a thug who tells him, "You're not in a dream now, are you?" All of which is to say that Inception is precisely the kind of brainy, ambitious, grand-scale adventure Hollywood should be making more of. Cobb runs a dream team of mindbending espionage agents, true inside operators. Their method is to slip some powerful businessman a drug to transport him into his dreamworld  except that it's their world, which they've devised to make so familiar that the subject will reveal what they want to steal. Ariadne, the new recruit, will be the "architect" of the fantasy. "You create the world of the dream," Cobb tells her. "You bring the subject into that dream, and they fill it with their secrets."